After a protracted legal battle that ended in March, the Latin American vendors make their triumphant return to Red Hook Park this summer. Every weekend throughout the warmer months, line up for cheese-covered ears of corn and the ever-popular pupusas, large corn pancakes filled with your choice of savory fillings. Catch the free Ikea ferry leaving from Wall Street starting June 18 for even easier access. When: May 31, 6 p.m.–8:30 p.m.
Manhattan’s perennial underdog neighborhood celebrates its newly minted status as a foodie destination with this big-tent event. For $100, you get unlimited tastings of creations from over two dozen beloved eateries, like Kefi, Dovetail, and the forthcoming outpost of Shake Shack. 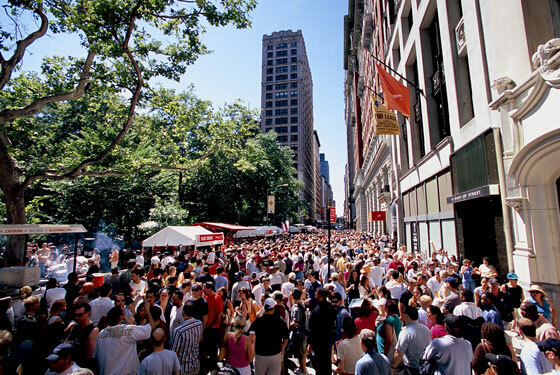 When: June 7–8, noon–6 p.m.
Danny Meyer’s annual meat festival places some of the nation’s top pit masters (Kenny Callaghan of Blue Smoke, Mark Glosserman of Hill Country) in Madison Square Park and unleashes a hungry public on them. The outrageously popular cookout is known for its long waits, so a smart investment is the $100 FastPass card, which grants access to express lines and functions like a prepaid debit card. For the more patient BBQ fanatic, however, $8 a plate is a steal. When: June 16, 7:30 p.m. The annual Citymeals-on-Wheels benefit turns its focus to the French masters this year. Honoring icons like Jean-Jacques Rachou and Pierre Triosgrois is an equally impressive roster of more than 30 highly talented chefs: Daniel Boulud, Eric Ripert, Tom Colicchio, Jean-Georges Vongerichten, and many more. When: June 29–30, 10 a.m.–5 p.m.; July 1, 10 a.m.–4 p.m. This annual juggernaut is typically regarded as a destination for industry insiders, but that’s no reason to miss out on sampling some of the latest high-end food products. Though you can’t take the newest spicy mustard or fancy chocolate home, with three days to snack your way around, it would be greedy to even try. When: July 13, noon–6 p.m. The annual French-independence-day celebration manages to make eating more civilized than at the average street fair with designated picnic areas. All the better to double-fist croissants and éclairs from the legendary Payard Patisserie & Bistro. When: July 15, 6:30 p.m.–8:30 p.m. The city’s biannual ten-day event offers three-course meals from more than 200 restaurants at irresistibly good prices: $24.07 for lunch and $35 for dinner. Reservations become available in late June, and they are some of the most sought-after of the entire year, so plan your dining strategy in advance.